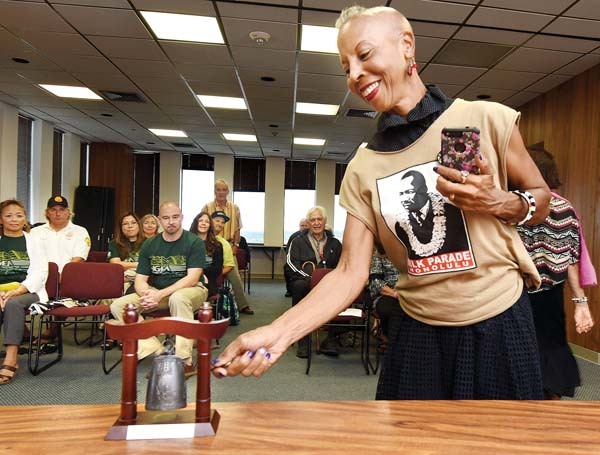 Terri Rainey, co-founder of the Dr. Martin Luther King Coalition on Maui and Oahu, rings a bell for the 39th and final time Wednesday to mark the 50th anniversary of King’s assassination. The bell ceremony sponsored by the Hawaii Government Employees Association was moved inside to the Mayor’s Lounge due to inclement weather. Participants took turns ringing the bell to mark the number of years of King’s life. 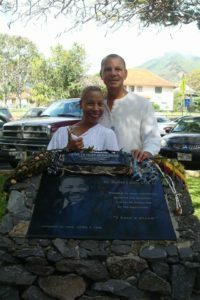 Maui retirees Terri and George Rainey have been involved in planning and promoting Martin Luther King Jr. Day celebrations in Hawaii for nearly two decades now. Terri Rainey recalled meeting the late civil rights leader for the first time in 1961 at her church in Los Angeles. “He inspired all of us to always do good and help others to help make a difference in their lives. I have carried his message with me all my life,” she said. 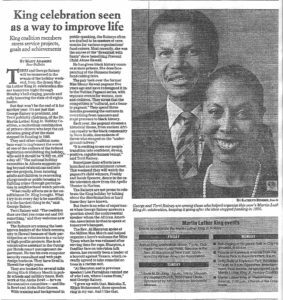 Rainey and her husband, George, founded the Dr. Martin Luther King Jr. Coalition-Hawaii (Honolulu) and have extended it to Maui. The Coalition has been working with the nonprofit African Americans on Maui Association to coordinate events on Maui. 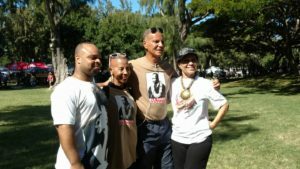 Rainey said it is the goal of the Coalition, which includes the Maui division, “to educate the community, especially the younger generation, about Dr. King, his principles, and how important it is to preserve his memory.” The 2012 Maui celebration runs throughout the week and officially opened Jan. 9 with Mayor Alan Arakawa signing a proclamation acknowledging the County of Maui’s recognition of the Dr. King holiday and his legacy. “Dr. Martin Luther King, Jr. was a leading advocate for civil rights through non-violent means nationally and internationally, and we shall honor his memory through our actions and deeds as a tribute to his legacy,” Rainey said. 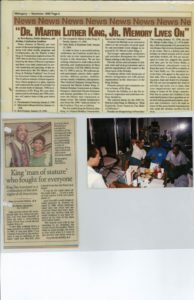 Residents can learn more about King by visiting the island public libraries to see special book displays made in tribute to King. There are also churches including Grace Church, Ka‘ahumanu Congregational Church and the Temple of Peace in Haiku, which are holding services honoring King on Sunday, Jan. 15. Celebrations culminate Monday, Jan. 16, with an inaugural bell ringing at 8 a.m. at the Ka‘ahumanu Congregational Church in Wailuku. A ceremony follows at the Dr. Martin Luther King Jr. Stone of Hope Monument in front of the County Building on High Street. The Stone of Hope monument, the only one of its kind in the State, was dedicated in 2006 in memory of the life and legacy of Dr. King. From there, a march continues on to Market Street. The holiday will close with an entertainment program from 3 to 6 p.m. at the Queen Ka‘ahumanu Center stage. All events are free and open to the public. The Honorable Governor Ben Cayetano flanked by Mayor Jeremy Harris and Me at “The Bell Ringing” at the Nagasaki Peace Bell honoring Dr. King’s Memory by holding candles in unison–1996 January. The Honorable Governor Ben Cayetano flanked by Mayor Jeremy Harris and Me at "The Bell Ringing" at the Nagasaki Peace Bell honoring Dr. King's Memory by holding candles in unison–1996 January.